by Rob - December 26th, 2008. 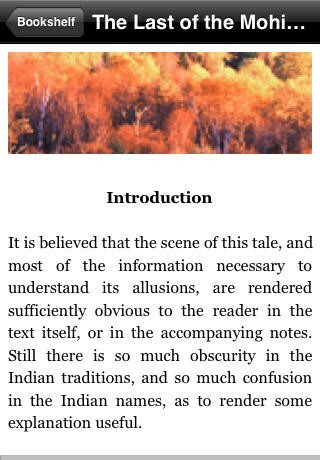 I had a chance to play extensively today with eReader 1.3 on an iPhone, and I must say I am very, very impressed. The iPhone version is a terrific implementation of the eReader software (much, much nicer, say, than the version of Mobipocket on the iRex iLiad). eReader is my favorite e-reading software, in part because it has a much better DRM system for commercial books than does Mobipocket. This new version of eReader for the iPhone includes most of the key capabilities of the versions long available for Palm and Windows Mobile devices: the ability to toggle justification, dictionary lookup, and the option to invert the screen (black background with white letters, instead of vice versa). Text renders beautifully in both Georgia and Helvetica typefaces (although providing Marker Felt was an odd third choice; I’d like to see Verdana). It’s an extremely pleasant reading experience, and the combination of an iPhone or iPod Touch with eReader would make a very good ebook-reading platform.